José Miguel Cabrera Torres, commonly known as Miguel Cabrera, is a baseball player for the Detroit Tigers of Major League Baseball (MLB). He was born on April 18, 1983 in Maracay, Venezuela. He is a first baseman and a right-handed player; he bats and throws right-handed. At the beginning of his career, he was a third baseman. 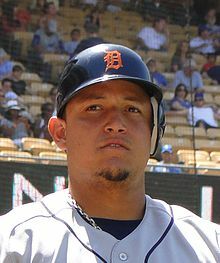 Cabrera is regarded as one of the best batters of all time - he currently holds the highest batting average among active players and is 2nd among active players in career home runs. Cabrera has played a total of 2,226 games and compiled .317 average with 462 homers and 1,613 RBIs from 2003 to 2017. He is a seven-time Silver Slugger Award winner. Also, he was an American League (AL) Home run leader in 2008, a AL RBI Champion in 2010, a AL leading hitter in 2011. In 2012, Cabrera won the AL Triple Crown, leading the league in home runs, RBI and average. He won the 2012 AL MVP. In 2013, he improved on the previous year's performance, and won a second AL MVP. Also, Cabrera is a popular MLB player. He is an 11-time All Star. He was a National League All Star in 2004, 2005, 2006, 2007 and an AL All Star every year from 2010 to 2016. He is nicknamed 'Miggy' by his fans. Cabrera is well known for his ability to drive pitches. He hits for power to all fields, and is able to hit every type of pitch. Cabrera's wife is named Rosangel. They have two daughters and one son. Cabrera and his family live in Birmingham, Michigan. Wikimedia Commons has media related to Miguel Cabrera (baseball). Batting stats at Baseball-reference.com. Retrieved December 13, 2011. Biography. Jockbio.com. Retrieved December 13, 2011. This page was last changed on 17 July 2018, at 04:23.